KEEP OUT OF REACH OF CHILDREN AND PETS. DO NOT USE IF OUTER SEAL IS BROKEN OR MISSING. Please consult your healthcare professional before using this product, especially if you are pregnant, nursing, have existing medical conditions or are taking prescription medications. Quercetin (as quercetin dihydrate), Pro-Longevity Factor ResveratrolTM Organic French red whole (skin, vine, stem, seeds) (Vitis vinifera) full spectrum polyphenol profile, certified muscadine red whole grape, (skin, vine, stem. seeds) (Vitis retundifolia), and natural Polygonum cuspidatum standardized to contain a minimum of 20mg of the trans-Resveratrol, Cynatine® HNS (Solubilized Keratin), Biotin, Vegetarian capsule (vegetable cellulose), rice bran, silica. 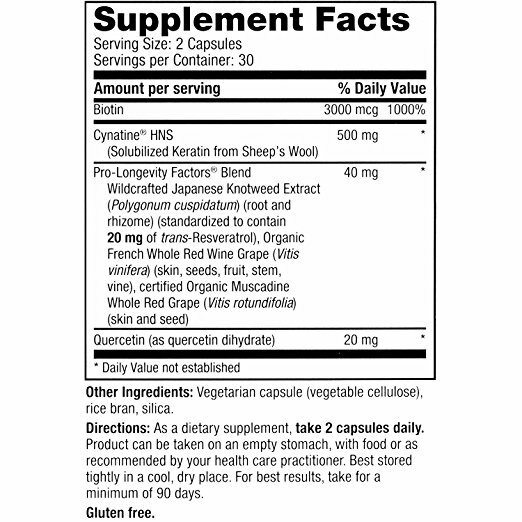 As a dietary supplement, adults take 2 capsules daily with meals or as directed by your health care practitioner. For best results, take for a minimum of 90 days.